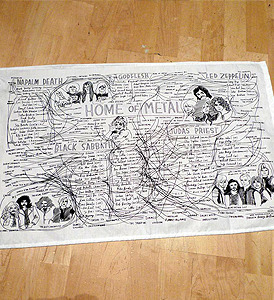 Some top Home of Metal clobber is available on our website now, including the essential Heavy Metal Family Tree tea towel by artist Bunny Bissoux, already selling fast! There’s also a t-shirt, tote bag, badge and many more lovely things to come. Go to the ONLINE SHOP to see more.